©2009 Cherilyn SunRidge, Live The Love. Acrylic, Poly-Vinyl, 19x26." There is a story now, a very nice one! 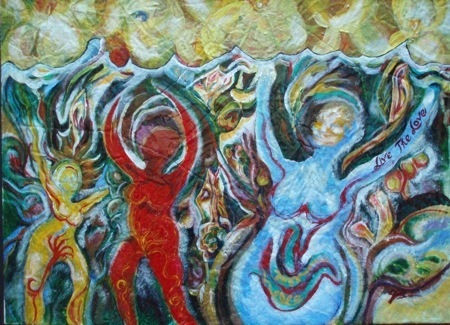 In July 2009 I painted “Live The Love.” The whole time in my studio, at this annual Feast of Mary Magdalene time, the Lady of Love and Compassion was apparent. She informed the paint and canvas and color and forms. She created the veil above which we can all reach through. She indicated color in living and jubilance in sharing one’s light. I submitted this art piece, along with two others, for inclusion in The Mary Show: Interpretations of the Divine Mother Archetype, an upcoming exhibit running 1-31 December 2010, in Fort Collins, Colorado at the Poudre River Arts Center, www.poudreriverartscenter.com. All 3 were accepted for inclusion (! ), and glory be, “Live The Love” was elected 1st Place in the Juror’s Choice Competition *!*!*! * I am so pleased and happy that this work is recognized for “what it is” and what it stands for. A thrilling time, indeed! And many thanks to the Poudre River Arts Center and to Carrie Johansing, Juror. 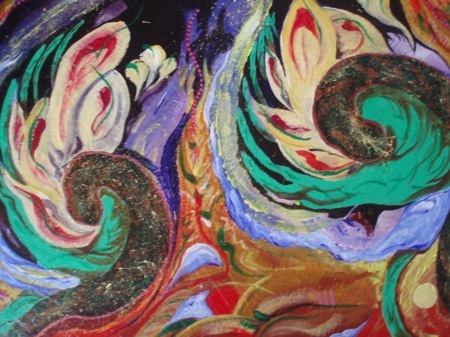 The other two canvases are: “Anoint Me, Grandmother Moon,” a piece giving honor to our 13 moon cycles, fed by an umbilicus from the Great Cosmic Mother touching down on earth; and “Play Your Original Light,” a piece finding the gentleness in the Great Serpent Creatrix, the Mother of all. You can view these on my website, www.CherilynSunRidge.com, in the wall&door hangings and floor canvases portfolio. To each of you–wishing you a light-filled color-filled day! ©2010 Cherilyn SunRidge, detail-Your World Has You. Acrylic, Poly-Vinyl, 55" diameter. You are the heart of your world, and your world has you as its heart……. The 55″ circular with fire-hole canvas has been delivered to its owner. The hilarity was that at the ‘end,’ my black photo backings were not large enough for the documentation. There was no black yardage in my little mountain town to be found, and resorted to using a sheet. There are two new operatives now: 1) never be without yards of black velvet, and 2) never let a deadline compromise your quality of work. Living and Loving another day!